…that North America’s largest five-axis gantry machine is located in Detroit and uses the world’s longest HEIDENHAIN linear scales? Called the CyberMill® by machine builder Ingersoll Machine Tools (www.ingersoll.com) in Illinois, this massive machine has an X-axis that is three quarters the length of a football field and is in operation at W Industries (www.w-industries.com), a leader of metal products manufacturing. 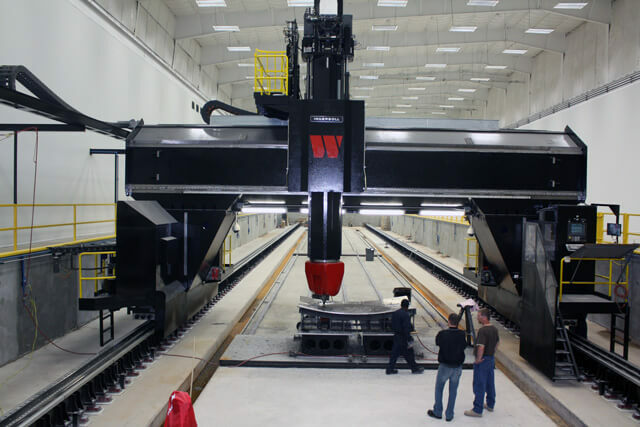 Called upon to handle the really big machining jobs, W Industries’ gantry machine is 20 feet wide by 204 feet long (with eight feet under its gantry). This CyberMill is running around the clock, guided by two 72 meter HEIDENHAIN LB 382 linear scales – the world’s longest – running down the length of the guideway. “The positional accuracy on these long HEIDENHAIN linear scales is ± 5 microns and the repeatability is exceptional,” said Martin Honer, a controls project engineer at Ingersoll. “We chose these scales because HEIDENHAIN makes the best feedback equipment in the business, and we were pleased that their LB scales carry distance-coded reference marks.” The distance-coded reference marks (semi-absolute) on the LB scales are extremely important on large machines as they allow it to “home” or ascertain its position at startup very quickly. To put this CyberMill’s size into perspective, staff at W Industries estimate that one could stack 78 Hummer H2 sport utility vehicles (without tires) two-high, three-wide, end-to-end within its table. Within that amount of space, many kinds of large structures can be machined, including large molds, jigs, fixtures and composite tooling. Rooted in work for the automotive industry, W Industries is currently taking off into aerospace with this CyberMill routinely doing what others cannot, such as wing and fuselage bond tools. “We plan to also be involved with flight hardware, special aerospace and alternative energy projects in the near future,” said Jason Sobiek, Director of Aerospace Manufacturing at W Industries. “With this giant CyberMill, we are now working on a program for the AirBus A350 airplane for Spirit, borne of a government bond that we believe is the largest to be issued in the state of Michigan,” said Sobiek. This high definition, high tolerance project consists of two long tools for the fuselage, both 16 feet by 70 feet, which utilizes about 1/3 of the travel of the CyberMill. All three of the axes on the mill include linear measurements provided by HEIDENHAIN’s LB 382C sealed linear scales (X axis is 200 feet, Y axis is 26 feet and Z axis is 8 feet).